A supermoto track is the perfect place to learn sport riding technique in a safe, low risk environment. The tight turns on a supermoto track allow you to practice cornering techniques used on larger bikes at a much slower speed. Although the speeds are slower (reducing risk), the thrill of leaning your bike over to the limits with complete confidence remains. Supermoto bikes are lighter, handle better, and are the perfect teaching tools for proper riding technique. We've designed our asphalt only days for riders who have no interest in riding dirt, but want to learn skills that will directly apply to their bike on pavement. You'll learn the skills necessary to properly control your bike in a safer environment and at a more reasonable speed. In addition you'll have an absolute blast! We're joined by long time performance riding coach Stuart Smith, who brings his experience of teaching hundreds of riders to ride like a pro. Stuart has coached some of the best riders in the world, and he can help you learn how to corner with the best of them. 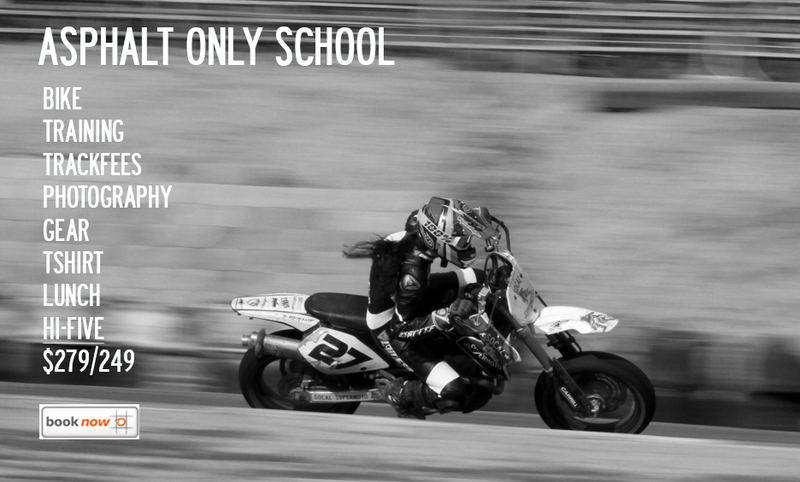 Our asphalt-only days are exactly like are standard supermoto school, only taught by Stuart Smith and do not include the dirt section. Training: basic supermoto riding techniques, safety, track prep, track etiquette.